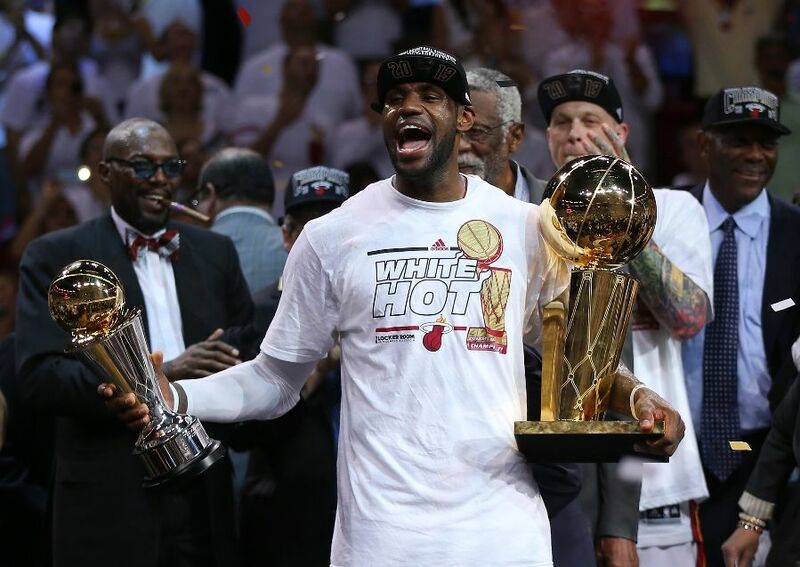 Enjoy the accolades, LeBron James. You’ve earned it. I remember my birthday back in 2010. I remember it very well. It wasn’t because of a party because I didn’t have one. I didn’t go out, but I stayed home that day. But that day stood out to me because it was also the same day as “The Decision.” That day made me dislike LeBron James. I wasn’t going to deny that he was a talented player. But the way he left Cleveland, the way he was so immature about so many things and then the way he handled the decision, made me think that the spotlight was too big and he wasn’t ready to handle it. I took joy in seeing the Heat lose their first year together. I cringed last season when they won the title. But now, after a thrilling third appearance in the Finals and a second straight title, I’ve finally let it all go. This isn’t to say that I am an angry, bitter basketball fan. I just didn’t like the way the Heat got together. I didn’t like the immaturity in James’ way of handling certain things. But with time, the feelings go away and after seeing the Heat win this one, I really don’t feel any more ill will. I’ll still prefer that the Heat don’t win anymore titles. I’ll take pleasure poking fun at the pathetic bandwagon fans. But it won’t bother me. It never really bothered much really before. But now it’s all gone. What we witnessed was a fantastic NBA Finals. Despite some blowouts, we were treated to a great series and I wish that it was a best of 9 series. It was that entertaining. And I saw how the Heat were able to handle the veteran Spurs in the last two games despite all the pressure. James played out of his mind and became that kind of player we all wanted him to be when he came into the league. He really earned it. The respect he was given proved it. Undoubtedly, James is the best player in the world. It was assumed during his time in Cleveland that he could win numerous championships with his talent. Unfortunately, he just had the talent but never became the leader. In this Finals, I finally saw that leadership quality that he had lacked in years past. He was clutch, he was leading the team and most importantly, he put the entire team on his shoulders. That’s admirable. That’s what I expect to see out of the top player in the game. James gave us that. And because of that, I now see the man that I wanted to cheer for in Cleveland. This isn’t really to say I am letting go of a grudge. My disdain for LeBron James didn’t make me go on message boards bashing him. I didn’t boo every time I saw him on TV. I just didn’t want him to believe that he was going to be given the ring. He had to earn it. I suppose now that he was pushed to the brink of elimination that he might understand it now. Because of that, I don’t feel any major ill will towards him. I still don’t want the Heat to win anymore titles. But I still will marvel at what James has become and that I appreciate. He’s grown up finally in my eyes. All the attention, pressure and adulation is all warranted. He’s earned it now and as a basketball fan, I can’t wait to see what he does next. He’s won me over. For so long I’ve demanded perfection from him. I’ve demanded a style in which he had to abide by. But now, he’s reached that plateau and he’s done it on his own terms. What more do I need to ask from him? Nothing. This doesn’t mean he’s off the hook for future mistakes. But right now, the slate is clean and I’m fine with it. He’s earned my respect. This entry was posted in Column, Miami Heat, NBA, Playoffs and tagged LeBron James, NBA Finals 2013. Bookmark the permalink. ← Farewell to purple for the Phoenix Suns?